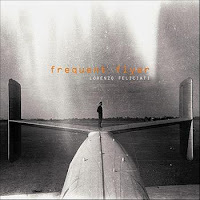 I hadn't really listened to much of Lorenzo Feliciati music before but this latest release has got me intrigued. Frequent Flyer is a surprising record that spans both rock and jazz. And while his roots have always been firmly planted in both genres, this album seems to beam with more urgency and cohesion. The addition of a diverse selection of musicians from both musical camps adds to the intense and exciting dynamic of this session. "The Fastwing Park Rules" sees Feliciati laying out a dark set of tones that are both bluesy, romantic and still futuristic. The basslines are slow and revolving, while Bob Mitzer adds a great deal of impassioned chords on top of Feliciati's notes. Rich and very effective. Wayne Shorter's "Footprints" (made famous by both Miles Davis and Wayne Shorter at different time periods) receives a very funky Latin twist. Feliciati gives an interesting rendition that I had never thought about. The drum work from Gualdi is fierce. Hearing Miles' lines as a bass is very shocking and turns out to be really cool. "Perceptions" provide a calming cover to the pulsating rhythms that proceed it. It's an ethereal journey whistling with gentle piano melodies and drones that quietly reminded me of Durritti Column or mid-period Cocteau Twins. This was outstanding only until you get to the next track, "The White Shadow Story" which pulls in both atmospherics and blues elements provided by Daniele Gottardo's guitar and DJ Skizo's manipulations. It's swirling and hypnotic but yet slings a very funky vibe. Feliciati waits 35 plus minutes to unleash the crowning moment of Frequent Flyer with a rousing version of King Crimson's "Thela Hun Ginjeet." The Crimson classic is a perfect challenge for Feliciati's bass talents and he delivers with a crushing display. In addition, he does surprising very well on Adrian Belew's vocals. Frequent Flyer is aggressive, bold and uncompromising. 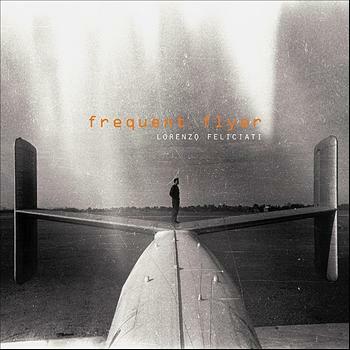 Lorenzo Feliciati delivers a document that really blew me away and has quickly become a recurring listen on my stereo. Frequent Flyer doesn't break the wheel of jazz fusion but it does present a constant and ambitious movement forward.